Red Shirts cruise to another title! Red Shirts made easy work of two very talented opponents this past Sunday, winning by a combined total of 49 points in their two co-ed games. In every facet of the game, they were rock solid, moving the ball with ease and stifling both opponents with suffocating defense. 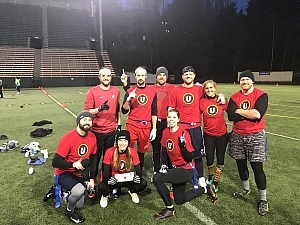 This was the Red Shirts second consecutive championship in the mid-core division and they are starting to build quite the formidable dynasty. Congratulations on a well deserved back to back championship run.